Premier Research Allicidin® provides broad-spectrum, premier quality immune support. It features Allicin Protein Complex™ which yields stabilized allicin (855 mcg/cap), the legendary immune compound in garlic, stabilized by a unique process. This formula also delivers European wild garlic (105 mg/cap), called Bear’s Garlic, the original non-hybrid garlic (not common kitchen garlic) used for thousands of years for superior immune support. The third complex, Botani-Pro Blend™, is included for optimal nutritional effect. Grown in open sea air on a volcanic island in rich volcanic soil. As the aloe is harvested in the field, its inner leaf gel is manually separated from its outer sheath. It is then immediately centrifuged to eliminate the water content, then immediately freeze-dried – all right in the field. This rigorous method delivers the freshest richest concentration of acemannan possible. Our delicate growing and processing delivers the highest amount of short-chain mannose sugars which are often deficient in other aloe products because the enzymes in the aloe can destroy the short chain mannose within hours of separation from the plant. Mannose sugars include beta 1-4D, a key building block for the healthy cell. Acemannan is a D-isomer mucopolysaccharide in Aloe vera. Studies show acemannan has immunostimulant, antiviral, antineoplastic and gastrointestinal properties. Some evidence shows acemannan may reduce mycotoxic body burden. Acemannan has been demonstrated to induce macrophages to secrete interferon (INF), tumor necrosis factor – a (TNF-A) and interleukins (IL-1). This suggests it may help to prevent or clear viral infection. In vitro studies have shown acemannan to inhibit HIV replication. Acemannan is currently being used for treatment of fibrosarcoma in animals. QRA testing results of Aloe Mannan-FX shows great promise for all mucus membranes, especially the upper GI; therapy localize to test points, or test at Thymus. Nutritional support for oxygen utilization by muscle and nerve tissue. Supplies octacosanol (from rice) with antioxidant enzymes SOD and catalase. Description: Colostrum supports healthy inflammation cycles, healthy immune response, cognitive abilities, respiratory health, skin health, pain management and detoxification. Colostrum helps to normalize, regulate and main bodily functions throughout the lifespan. Premier Research Colostrum-21. Colostrum is a special immune-active fluid secreted by a female cow for about three days after giving birth. Colostrum-21™ is made from 100% whole bovine colostrum that is not defatted and pesticide-free. 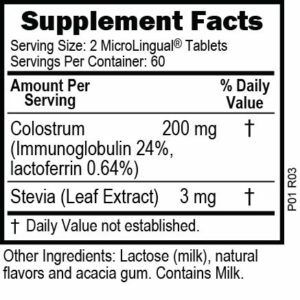 Colostrum-21™ contains 21% immunoglobulins (IgG) (634 mg/tsp, 74 mg/cap) for effective immune support. In addition, this concentrate delivers a full-spectrum of multiple immune support agents including lactoferrin (21.4 mg/tsp, 2.5 mg/cap), N-acetylneurominic acid (103 mg/tsp, 12 mg/cap) and IGF-I (6,429 ng/tsp, 750 ng/cap). Our colostrum is obtained from a very select group of dairy farmers dedicated to producing quality colostrum. During the summer, spring and fall, their cows are grass-fed (a superior nutrition source for cattle). During the winter, they are fed hay. "High Quality Colostrum from Margaret's Practitioner Lines"
Supplies glandular specific support as Neonatal Thymus Concentrate (bovine), combined with SOD and catalase, important antioxidant enzymes. Thymic function is critical in immune health, however thymic function declines with age. The thymus gland is most active following birth (neonatal stage). "Supports the Thymus - the "Commander-in-Chief" of the Immune System"
Benefits: Strengthens the immune system. Stimulates body’s natural immune defenses. Acts as an antioxidant. How It Works: This formula provides powerful support for the immune system. Beta-glucans stimulate the immune system into action. They increase the production of macrophages, T-cells, B-cells, natural killer cells and cytokines, all of which strengthens the body’s natural defense system. Arabinogalactan stimulates natural killer cell and macrophage activity. It also helps increase Bifidobacteria and Lactobacillus flora, two beneficial types of bacteria. Rich in protein and immune-enhancing transfer factors, colostrum supports the immune system of the newborn. It also helps protect beneficial microorganisms in the intestinal tract to bolster defenses. Reishi and maitake mushroom are thought to boost immune activity, increase the activation of natural killer cells and activate macrophages. Cordyceps increases T-cell and B-cell activity, important to immune response. Ingredients: Beta-glucans, arabinogalactan, colostrum, cordyceps mycelia, reishi mushroom mycelia and maitake whole mushroom. Recommended Use: For maintenance, take 1 capsule between meals two or three times daily. For periods of immune system stress, take 6– 10 capsules daily. Jarrow FORMULAS® IP6 contains 500 mg of purified Inositol Hexaphosphate (IP6) from rice bran extracted in Japan. IP6 is a phosphorylated form of inositol commonly found in fiber-rich plant foods. IP6 supports immunity and cardiovascular health by enhancing Natural Killer (NK) cells and chelating reactive iron to protect against corrosive hydroxyl free radicals. Biotics Research Nucleozyme Forte. Supplemental source of RNA and DNA with synergistic vitamins and mineral components. Consider as a fortified multiple formula for seniors or where supplemental RNA and DNA is indicated. Provides key vitamins and specific minerals, combined with a proprietary complement of botanical compounds possessing immuno-modulating properties. Offers unique supplemental support for normal, healthy immune function.